Welcome to the Lazarowitz lab! Our overall goal is to identify the molecular and cellular events, which underlie the ability of viruses to infect and spread within a plant to cause disease. Because viruses are obligate intracellular parasites, defining these events can not only lead to the rational development of anti-viral strategies, it also provides insights into how the host regulates gene expression, signal transduction and macromolecular trafficking. For plant viruses, an essential element of their disease potential is their ability to cross the barrier of the plant cell wall to invade the host. Our research has focused on a novel class of proteins encoded by plant viruses: ‘movement proteins’, which play a key role in coordinating replication of the virus genome with its directed transport to and across the plant cell wall. We use the model plant Arabidopsis thaliana and two model plant viruses: the DNA geminivirus Cabbage leaf curl virus (CaLCuV), and the RNA tobamovirus Tobacco mosaic virus (TMV). Employing a variety of approaches –– from molecular and classical genetics to biochemistry, structural biology, confocal imaging, robust transient expression assays and functional genomics –– we have established the current model for how geminivirus movement proteins act to transport the viral genome within and between cells. The regulation of nuclear import and export in plant cells. The role of vesicle trafficking in plant cell-cell communication. The geminivirus movement proteins NSP (nuclear shuttle protein) and MP (cell-to-cell movement protein) interact. 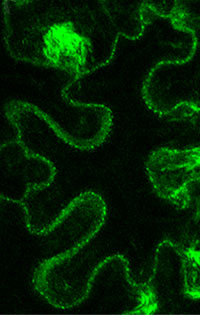 An NSP-GFP fusion expressed by itself in N. benthamiana protoplasts localizes to the nucleus (“NSP”). When NSP is co-expressed with MP, NSP is trapped in the cytoplasm by MP, which directs it to the cortical ER (location of MP) (“NSP+MP”). Shown are projected Z series of confocal images. Red is chlorophyll autofluorescence. On the right is an Arabidopsis plant infected with the geminivirus CaLCuV. Confocal image of N. benthamiana epidermal leaf cell expressing the synaptotagmin SYTA fused to GFP. SYTA is seen to localize to endosomal vesicles.